In German with English subtitles. AgfaColor. 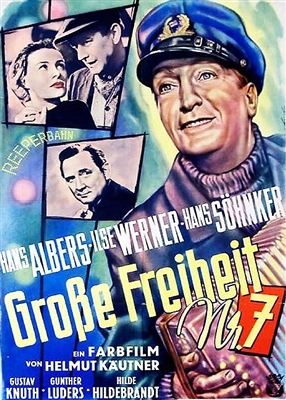 The original German title of this film is "Große Freiheit Nr. 7," and it is also known as "Port of Freedom." The title comes from Große Freiheit (Grand Freedom), a street next to Hamburg's Reeperbahn road in the St. Pauli red light district, where Hans, "The Singing Sailor" (Hannes Kroeger ), works at a dive bar and falls in love. Shot in color with the full support of the Nazi government, the picture was subsequently banned by the Nazis for the film's "unflattering depiction of German soldiers" and for being "unheroic" and was not shown in Germany until after the Allied victory in 1945. This is a very unsuspecting movie. Almost a "little" movie. The stakes aren't high. It's light and whimsical, yet everything about it is done to sheer perfection. Buy it.